After nearly 28 years of living on this planet, I started taking music classes last week. Besides a few music classes in elementary school that I never retained, this is my first serious attempt to learn an instrument. I debated for months which instrument I wanted to start with. I kept thinking about which instrument would be the most fun for me. Throughout, I kept thinking drums were probably the most fun. I have a good sense of rhythm and I have always heard pounding the skins was a great physical, mental, and emotional release. I also entertained the idea of learning something unique like accordion. However, considering that I am at the tail end of my 20s, I tend to think more practically now. I settled with guitar. Guitar was the one instrument I tried avoiding because it is the cliché go to instrument for all new musicians. I tried to find an alternative, but it ultimately made sense to me to start with the guitar. Despite the tropes of an amateur guitar musician, there has to be a reason guitar is the most common first instrument. Right? I have always loved music. I enjoy a wide variety of music from simple pop staples to complex musical arrangements. My interest and fascination allowed me to develop a deep social and historical understanding of contemporary music. Why this album matters or how this artist influenced this region, and other things like that. But not being a trained a musician kept me from understanding the fundamental building blocks of popular music. I could not adequately discuss chord changes or things like that with any semblance of intellectual understanding. Despite my lack of knowledge on how notes formed to make a song, I always became annoyed by overly analytical people who simplified the process. There’s a famous YouTube video where a few guys explain how a simple chord structure exists in almost every pop classic of the last 30+ years. They then play various songs using this chord structure and seamlessly segue from song to song. Sure, there are only a finite number of notes and chords, but I have never heard “With or Without You” come on the radio and thought I love “Don’t Stop Believing!” People who are overly analytical and suggest that all pop music is the same tend to take the magic out of music making and listening. For me, what makes the arrangement of three chords special is the personality behind those chords. An artist who can make something theirs by influencing the sound with their personality makes it unique as if it was a different song altogether. I do enjoy a good cover song. It gets boring when cover songs copy the original in every respect (i.e. Roxy Music doing the improvised whistle Lennon does for “Jealous Guy”). However, what I want from a cover song is ownership. There is a reason why Hendrix’s “All Along the Watchtower” is so much different than Dylan’s original. It is because he owns it. Hendrix wasn’t trying to do Dylan. The Violent Femmes’ rendition of Culture Club’s “Do You Really Want to Hurt Me?” is a great tribute to the concept of cover ownership. It isn’t a great tribute because it is superior to the original (in many ways, it is not), but rather because it takes an existing work and rebrands it. By changing lyrics, altering arrangements, and emphasizing different words, the Violent Femmes almost seem like they are doing an entirely new song. Their rendition is fun and full of humor. The Femmes knew exactly that they were doing; taking a song they enjoy and reforming it in a way that is musically interesting to them. Listening to their cover, there is no doubt that you are listening to the Violent Femmes and not the Violent Femmes emulating Culture Club. This is the right way to cover a song. When covering a song, pay tribute instead of being a tribute band. Music is another way of telling a story. As humans have done for thousands of years, we pass down stories from generation to generation. Along the way, the stories slightly change in this transgenerational game of telephone. Things might sound similar if they exist within close proximity to each other of a timeline, but there’s more to music than chords and notes. Music is a reflection of ourselves and how we perceive society, and that is always evolving. We take constructs and alter them to our liking. 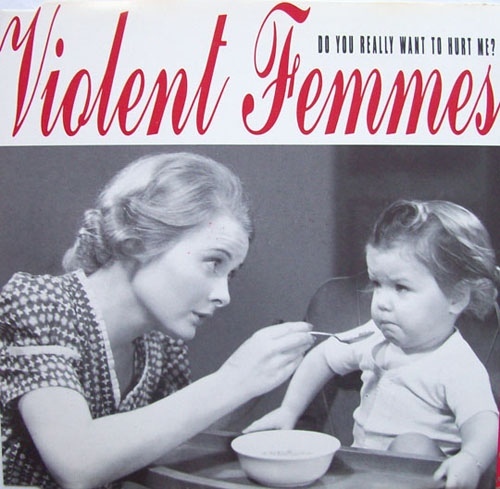 The Violent Femmes were having fun when making this song. You can hear the humor resonating from the track. Don’t take that humor and enjoyment away by being cynical. Do you really want to hurt music? I don’t. This entry was tagged cover songs, culture club, do you really want to hurt me, violent femmes. Bookmark the permalink.